Did I forget to show you my progress??? It's almost time, it's almost time! I loved this sweater so much, I'm knitting one for my step-mother. I'm still knitting the body of the sweater so the pictures aren't too exciting yet. 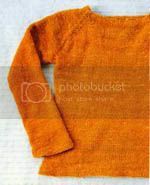 I'm knitting this sweater with Blue Sky Alpaca cotton yarn. I love this stuff, it's soft and thick, but not too thick. The yarn color is 606 Shell, which my step-mom loves. I've knit this sweater before (see the Cast Off album) so it's knitting up quickly. I'm skipping the hems on this sweater so the edges will roll up instead of be flat and square.